(VIDEO) Texas Tech faculty members were instrumental in a critical part of this discovery. Less than two weeks after the founders of the Laser Interferometer Gravitational-Wave Observatory (LIGO) were awarded the Nobel Prize in Physics for the detection of gravitational waves, LIGO scientists, including Texas Tech University's own Alessandra Corsi and Benjamin Owen, are announcing another major scientific breakthrough. On Aug. 17, LIGO and Virgo, its European counterpart, detected gravitational waves from the merger of two neutron stars 130 million light years away, an event dubbed GW170817. A mere 1.7 seconds later, the NASA/Fermi satellite recorded a flash of gamma rays, but scientists immediately noticed the rays were substantially less bright than all the gamma rays they'd previously seen. Hours later, the merger was detected in ultraviolet, visible and infrared light. X-rays showed up nine days later, and on the 16th day, Corsi's team finally detected a radio signal from the event using the Karl G. Jansky Very Large Array (VLA) at the National Radio Astronomy Observatory, a facility of the National Science Foundation (NSF) operated under cooperative agreement by Associated Universities Inc.
Those radio and X-ray observations became key to deciphering the mystery of the too-dim gamma rays. Neutron stars are different from regular stars. When large stars explode and collapse in on themselves – a phenomenon called a supernova – what remains is the star's small, ultra-dense core. The electrons and protons found in normal matter melt into one another, forming neutrons – hence the name. When two neutron stars approach one another, spiraling in toward their eventual merger, they send off gravitational waves. It had been hypothesized that after the neutron stars collide, a jet of fast-moving material is emitted at high latitudes, where gamma rays are produced in a phenomenon known as short gamma-ray burst. As this jet gradually decelerates and expands, X-rays and radio waves – with a very high frequency, far above what humans can hear – are also emitted in a phenomenon called afterglow. The Fermi satellite detection of gamma rays only 1.7 seconds after the LIGO detection represents the first direct proof that short gamma-ray bursts originate from binary neutron star mergers. Every previous observation of gamma-ray bursts has involved a jet pointing from the source to Earth. Because in this event it took the X-rays and radio waves so much longer to reach Earth than the gamma rays and visible light, scientists now believe they are seeing the gamma ray burst from the side. "This is the first time a gamma-ray burst has been seen whose jet wasn't directly pointed at Earth,” said Corsi, an assistant professor at Texas Tech. "We think that when this merger took place, we weren't lucky enough to sit exactly on the axis of the fast jet. Radio tells us we observed the light from the neutron star merger but we saw it differently from before, when we had this really privileged viewpoint of gamma-ray bursts. Because seeing neutron star binary mergers from an off-axis perspective is far more likely than having them point directly at Earth, scientists can now use radio waves to study the emission from events like GW170817 instead of waiting for a direct hit from a gamma-ray burst. Observations of off-axis bursts offer a unique opportunity to probe how fast jets produced in neutron star mergers drill through the tidally ejected material and how they later interact with the interstellar medium – the matter between stars. GW170817 also is the first time any astronomical event has been observed in both gravitational waves and in light. It's important to study astronomical events through as many messengers as possible to get the most accurate and complete understanding of it. "There's a fundamental difference between optical-infrared emission and X-rays and radio,” Corsi said. "The emission in optical and infrared probes the neutron-rich ejecta and how heavy elements are being formed – in this merger, you get elements heavier than iron forming via a series of nuclear reactions so we can explain how gold, platinum, etc. are created. The radio and X-rays probe a different type of emission and provide complementary information, such as how much energy is coupled to the fastest ejecta, and in fact they tell us that there is a fast (relativistic) component. The findings achieved from this binary neutron star merger are likely to have far-reaching effects throughout the entire field. "This is really going to change the way we do astronomy,” Corsi said. Time frequency plot of LIGO data showing the detection. Texas Tech played a leading role in the detection of the radio signal that has been so instrumental in this event. Corsi is the principal investigator of an observing program on the VLA through which the first images of the radio counterpart to the gravitational wave event were collected. Her work is funded by a National Science Foundation (NSF) CAREER Award specifically geared toward joining gravitational wave and radio observations. After the gravitational waves and gamma rays were detected, a bright optical transient consistent with the sky location of the gravitational waves was identified by the Swope telescope at Carnegie Observatories' Las Campanas Observatory in Chile. 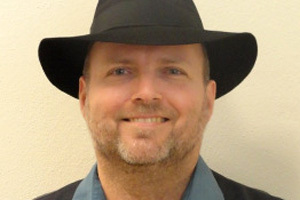 The optical counterpart was also detected by several other teams, including the Distance Less Than 40 Mpc survey, led by David Sand of the University of Arizona, a collaborator of Corsi and former Texas Tech colleague. Corsi and her team triggered their VLA program in response to the optical detection, in hopes of finding a radio counterpart. "From that day, the thing I remember most clearly is a message from Dale Frail of the National Radio Astronomy Observatory, a co-investigator on my VLA observing program and a long-term collaborator, saying, ‘You better be ready' with a smiley face at the end. That was just so exciting!” Corsi said. Texas Tech is also a member of a larger team of astronomers and physicists, called the Global Relay of Observatories Watching Transients Happen (GROWTH), who joined forces right after the LIGO alert to hunt for light from the cosmic smashup. "Being part of GROWTH was particularly useful because it put me in contact with our colleagues who used the Australia Telescope Compact Array to confirm the radio detection a few days after my team had announced it,” Corsi said. The results of this effort appear today in an article published in the journal Science (Hallinan, Corsi et al. DOI 10.1126/science.aap9855). A comparison of the near-infrared and radio counterparts to GW170817. (A) Near-infrared image taken on Aug. 27. (B) Radio image of the same field created using VLA observations on Sept. 9. (C) A combined image from four VLA operations spanning Aug. 22 to Sept. 1. 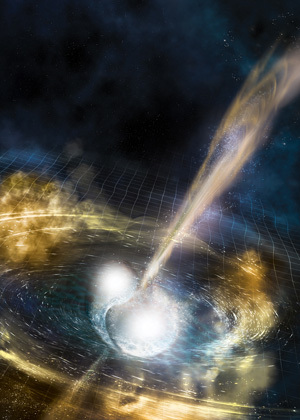 Owen's work on this discovery focused primarily on studying the structures of the neutron stars through the tidal effects on gravitational waves produced in the merger. The original gravitational wave detection from two merging black holes, an event dubbed GW150914, verified Albert Einstein's prediction from his 1916 General Theory of Relativity. This neutron star merger gave scientists another opportunity to test the theory. The gravitational waves and the gamma rays arrived at Earth only 1.7 seconds apart after travelling 130 million light years. "This puts a really tight constraint on it,” Owen said. "If there's some deviation from the speed of light, that deviation has to be really small. 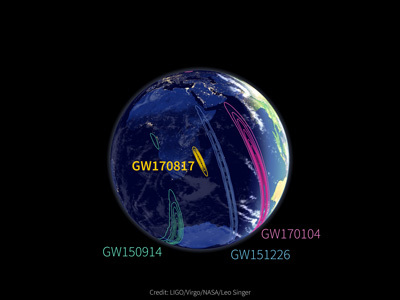 Sky localization showing GW170817 compared to previous events that didn't have Virgo to help pin them down. The General Theory of Relativity is not the only scientific principle that gravitational waves are helping to solidify. Scientists have worked for generations to pinpoint the Hubble Constant, the unit of measurement used to describe the expansion of the universe. At the time of the discovery, the Texas Tech LIGO team also included postdoctoral researchers Santiago Caride, Rob Coyne, Ra Inta and Nipuni Palliyaguru and graduate students Binod Rajbhandari and Eric Sowell. The LIGO Science Collaboration and Virgo Collaboration consist of a thousand scientists and engineers at dozens of universities around the world. LIGO is funded by the NSF, and operated by Caltech and the Massachusetts Institute of Technology, which conceived of LIGO and led the Initial and Advanced LIGO projects. Financial support for the Advanced LIGO project was led by the NSF with Germany (Max Planck Society), the U.K. (Science and Technology Facilities Council) and Australia (Australian Research Council) making significant commitments and contributions to the project. More than 1,200 scientists and some 100 institutions from around the world participate in the effort through the LIGO Scientific Collaboration, which includes the GEO Collaboration and the Australian collaboration OzGrav. Additional partners are listed at http://ligo.org/partners.php. The Virgo collaboration consists of more than 280 physicists and engineers belonging to 20 different European research groups: six from Centre National de la Recherche Scientifique (CNRS) in France; eight from the Istituto Nazionale di Fisica Nucleare (INFN) in Italy; two in the Netherlands with Nikhef; the MTA Wigner RCP in Hungary; the POLGRAW group in Poland; Spain with the University of Valencia; and the European Gravitational Observatory, EGO, the laboratory hosting the Virgo detector near Pisa in Italy, funded by CNRS, INFN and Nikhef. The Texas Tech University College of Arts & Sciences was founded in 1925 as one of the university's four original colleges. Comprised of 15 departments, the College offers a wide variety of courses and programs in the humanities, social and behavioral sciences, mathematics and natural sciences. Students can choose from 41 bachelor's degree programs, 34 master's degrees and 14 doctoral programs. With just under 11,000 students enrolled, the College of Arts & Sciences is the largest college on the Texas Tech University campus. In fall 2016, the college embarked upon its first capital campaign, Unmasking Innovation: The Campaign for Arts & Sciences. It focuses on five critical areas of need: attracting and retaining top faculty, enhancing infrastructure, recruiting high-potential students, undergraduate research and growing the Dean's Fund for Excellence. The Department of Physics is active in a broad range of research and teaching activities designed to prepare undergraduates for challenging careers in science and technology. Graduates of the department have gone on to successful careers at universities, national laboratories, and in industry. The department offers the Bachelor of Science degree in physics, and in cooperation with the College of Engineering, also offers courses leading to the Bachelor of Science in engineering physics. The Office of Research and Innovation is tasked with facilitating excellence in research, scholarship and creative activity for Texas Tech students, faculty and staff. The office promotes an academic environment embracing creativity, curiosity, innovation, diversity, ethics and integrity. 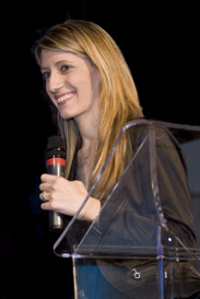 Among other programs, the OR&I supports responsible and safe conduct of research, faculty development and recognition, interdisciplinary collaborations, externally sponsored research, partnerships with industry and community stakeholders, international research collaboration and the application of research for the benefit of society. The OR&I promotes a culture of creative expression, discovery, innovation and collaboration with the goal of advancing Texas Tech's status as an elite national research university.